June required several new drawings as more and more produce is becoming available. The color palette is opening up, which, in addition to beautiful meals, also means a larger variety of vitamins and minerals. An Eat the Rainbow post is soon to come that explores the range of antioxidants in the many colors of foods, and their benefits. One way I added to that rainbow was to pick 10 pounds of strawberries—practically a required summer activity in Oregon. If you’re new here, visit April and May produce logs for an introduction to my yearlong project to track my fresh produce dollars. You can download each one as a PDF. Here is June. Even those of us who cook often find ourselves stymied by what to do with our market or garden loot. The pressure to be creative or break out of eating ruts can conspire to over complicate what can be simple. Most foods that grow in the same season go well together. Foods that are fresh and seasonal don’t need much fussing. Instead, let the real taste of the fruit or vegetable sing. Two great sites I refer to often are Culinate, which posts wonderful food stories and seasonal recipes, and Epicurious, which is my go-to recipe source. Instead of trying to figure out what to cook for the week, I simply buy what looks good and is in season. Then I plug in what I’ve got into the search field and modify recipes if I don’t have an ingredient the recipe calls for. How did I eat this month’s produce? Artichoke: I lamented to chef Kathryn LaSusa Yeomans of The Farmers Feast that I preferred the versatility of baby artichokes and had lost my interest in basic steaming of large artichokes. She suggested tucking chopped fresh herbs like basil, mint and parsley and chopped garlic into the leaves. For a dipping sauce, I melted a little butter and added slivered garlic, fresh lemon juice, salt and pepper. Wonderful! But I await the baby artichokes to make one of my favorite dishes, a Roman stew called la vigniarola, with fava beans, pancetta and peas. 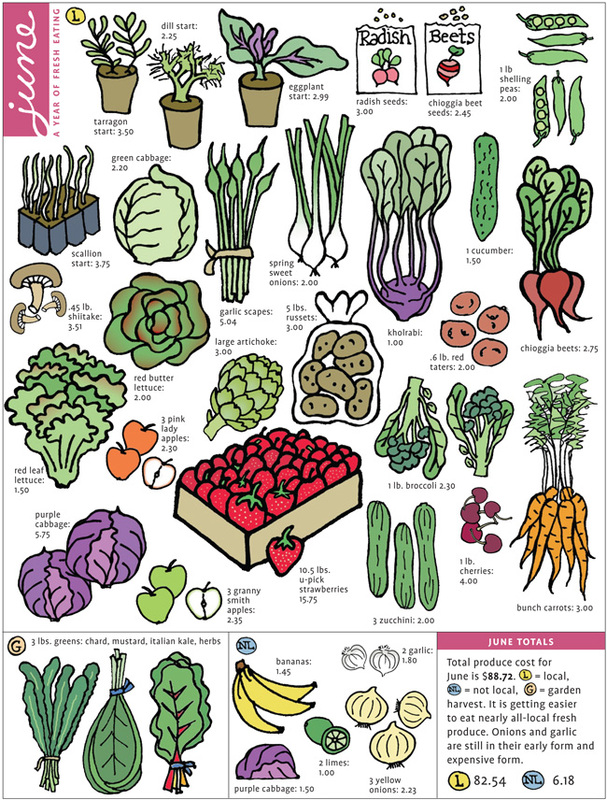 See my artichoke piece in last year’s farmer’s market newsletter. Kohlrabi: Veggie Borg, I like to call it. A truly bizarre looking vegetable. Kohlrabi has a nutty, fresh flavor and is wonderful shaved onto salads or cut into sticks and used for dip. It reminds one of jicama. Cabbage: The reason for all this cabbage? Homemade sauerkraut, which is brewing in the kitchen. It smells, like, well, sauerkraut…in a good way. Zucchini: Though many say baby zucchini are tastier than large ones, they can be expensive. I’d rather get more bang for my food buck. 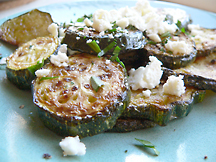 Summer squash is great grilled or slow sautéed in a skillet till they caramelize. Just add a squeeze of lemon and a sprinkle of fresh herbs and crumbled feta. See my piece on summer squash in last year’s farmer’s market newsletter. I’m also making refrigerator zucchini pickles. Here’s a recipe from the Zuni Cafe, but I’m cutting down on the sugar and may add other herbs. You don’t need to do special canning. They’ll keep in a jar in the fridge. Pictured is Deborah Madison’s recipe for zucchini circles. Saute on low heat for a long time till zucchini starts to brown and the sugars caramelize. Squeeze some lemon, sprinkle crumbled feta and chopped herbs like basil, parsley or mint…or all three. Farro Salad with Roasted Beets and Peas: I roasted chioggia beets, and cut them into cubes for a farro (substitute any grain like wheat berry or quinoa) salad. Fresh shelling peas were added along with spring onions, a lemon and olive oil vinaigrette and fresh dill and chives from the garden. Stay tuned for a post about grains and how to incorporate them more into your diet. Farro (or Quinoa) Salad with Zucchini and Peas: Another great grain salad using zucchini raw, grill or sauté it till browned for extra flavor, then chop and add it to the grains. A can of chick peas makes this a complete protein—great for your vegetarian friends. Add the herbs, lemon/olive oil vinaigrette and crumbled feta or goat cheese. You can use shelled fresh peas or cut sugar snap peas. Please share! More to come. Happy 4th!